What Destiny Holds For You…. ♥ Prediction has finally come true: INDIA wins!!! ICC 2011 Cricket World Cup ? The 2011 ICC Cricket World Cup is the tenth Cricket World Cup and is being played in Bangladesh, India and Sri Lanka. It is Bangladesh’s first time co-hosting a World Cup. All matches in the World Cup will be accorded One Day International status, with all matches being played over 50 over’s. The World Cup will take place from Saturday, 12 February to Saturday, 2 April. The final will be played on Saturday, 2 April at Wankede stadium Mumbai, India. Cricket is considered as a religion in India and people are crazy about Cricket, especially in this part of the world. And one can say ‘Sachin‘ is the GOD of Cricket. It’s been a crazy year for India in competing among the best in the league and here they are now in one heart and soul to bring back the Golden Cup back home. You may never know which underdog has come up in the league with the masters. So we can say that cricket is a game that can be won by one who has the dedication, confidence and team support. As for my favorite team, it has to be: INDIA. 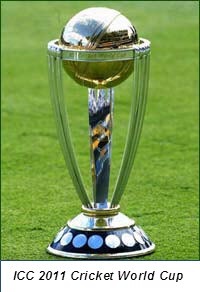 So which team do you think will win the 2011 ICC Cricket World Cup? What is searched the most? Authors - U and Me! The best laptop should be one that checks all the boxes: Great battery life, beautiful design, and top-notch performance. Our picks for the best laptops you can buy do all that — and throw in some extra features while they're at it. The post The best laptops of 2019 appeared first on Digital Trends. The Volkswagen ID R electric race car will head to the Nürburgring to set a lap record. With Romain Dumas at the wheel, the ID R will try to become the fastest electric car around the grueling, 12.9-mile long track. The post Volkswagen prepares its electric ID R race car for its toughest challenge yet appeared first on Digital Trends. Rugged cameras are designed to withstand nature's elements. These waterproof, dustproof, and shockproof shooters can go wherever you take them, making them the perfect travel companions. The post The best waterproof cameras of 2019 appeared first on Digital Trends. Details for Persona 5 The Royal, an enhanced re-release of the original game, have been revealed in a new trailer from Atlus. The Royal introduces a new character that joins the Phantom Thieves and improves the overall experience. The post Persona 5 The Royal due in 2020, will introduce new character and story chapter appeared first on Digital Trends. When the Laundroid was first announced almost three years ago, then shown off at last year's CES, it was met with a fair bit of both intrigue and derision. But now Seven Dreamers, the company behind it, says the company is out of money. The post The startup behind the world’s first laundry robot has folded appeared first on Digital Trends. Our complete list of what's new on Netflix for May 2019 and which titles will be removed will help you catch up on your bingeing, and also ensure you don't miss any titles heading into the streaming ether. The post What’s new on Netflix and what movies and shows are leaving in May 2019 appeared first on Digital Trends. Amazon knocked $220 off the price of two Bose 301-V Direct/Reflecting bookshelf loudspeakers, a 50% discount. The 301-Vs are suited for music or for home theater systems. Amazon's sale also includes the Bose Solo 5 TV Sound System. The post Amazon drops prices on Bose speakers and sound systems by up to 50% appeared first on Digital Trends. Whats is happenening in jQuery?